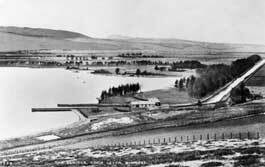 Between 1827 and 1832, the upper reaches of the River Leven were canalised, the loch lowered by 1.4m and the flow regulated by sluices. This regulated the flow to water-powered industries along the river and allowed adjacent land to be reclaimed. The house (centre) was built for a sluice keeper whose job it was to regulate the flow and keep the new cut free of ice and debris. The work was authorised under a special Act of Parliament and the cost shared amongst mill owners.